An overview of the philosophy of classical education and the ways in which home schoolers can pursue classical learning at home. Covers the distinctives of classical education, the benefits to the student, the three stages of classical learning (grades 1–4, 5–8, and 9–12), the subjects taught in each stage, and the overall goals of classical education. Also discusses the place of delight-led learning, and offers ways in which every home schooler can borrow from the classical tradition. 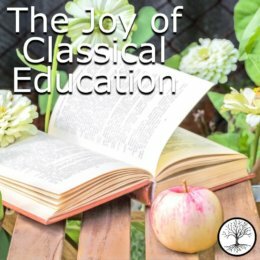 The most straightforward introduction to classical education around! Listen to it and get your bearings; then pass it on to your spouse and your mother-in-law.